After a bit of digging, I've found the web interface for the Surfbeam 2 modem. You can reach it at 192.168.100.1 when plugged into its ethernet port. Best thing to do is turn the modem off, plug the cable in, turn it back on and your laptop/PC should be assigned a temporary IP in the range 192.168.100.x - go to the router's address quite quickly, before it gets online, as your IP will soon change to the dynamically populated one provided by Skylogic. There's quite a lot of useful info there though. 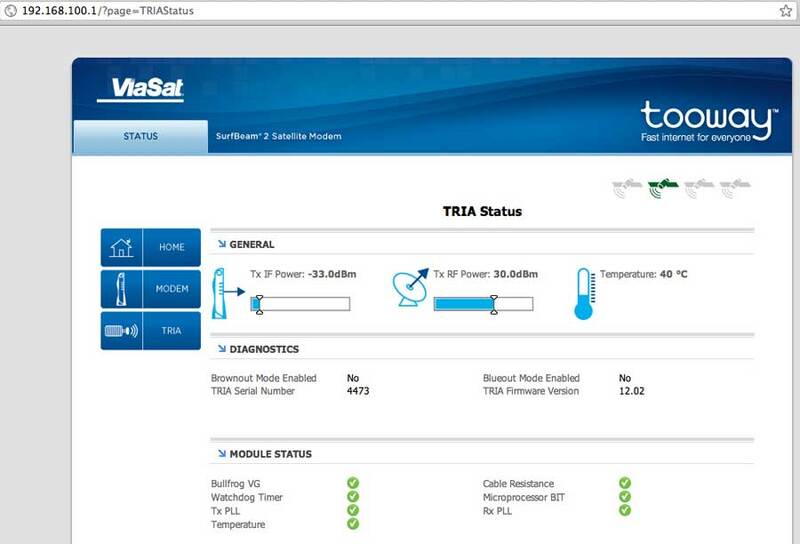 Thanks for the screen shots of the web interface.Done my first Tooway KA2 install yesterday and would like to know if the TX and RX figures are acceptable. Like the first KA & KU system these modems give very limited installer info so would like to know what a well aligned dish should be showing when online. Where we where had no cellphone reception so I couldnt use the Tooway alignment app so was informed by BW that we where on orange beam. Now back at home the alignment tool advises Blue beam 1. Regarding pointing, the really important thing is to peak up to the exact peak. �The actual level you measure will depend on your location relative to the nearest satellite spot beam centre. �To get your dish pointed perfectly move off either way (in both azimuth and elevation) and find two exactly equal degraded points, then put to the exact centre. Your dish works in Ka band (20/30GHz) and has very narrow beam, particularly at the transmit uplink frequency so exact central pointing is important. �In clear sky conditions the signal is very strong and the system will work, on receive, over a wide range of antenna mispointing. �This is very misleading to the naive installer - just getting a good enough signal is NOT acceptable. You must actually get to the beam centre. �The top of the receive beam is rounded and finding the centre is not at all obvious. You must get to the centre so that the transmit beam, which is narrower, is also pointed well. �The system will then continue to operate in moderate rain. �If you are mispointed the system will fail as soon as it rains. [quote author=mailliw link=1310245551/0#0 date=1310245551]After a bit of digging, I've found the web interface for the Surfbeam 2 modem. You can reach it at 192.168.100.1 when plugged into its ethernet port. Best thing to do is turn the modem off, plug the cable in, turn it back on and your laptop/PC should be assigned a temporary IP in the range 192.168.100.x - go to the router's address quite quickly, before it gets online, as your IP will soon change to the dynamically populated one provided by Skylogic. Hi, You're quite correct that once the system has connected to the Tooway network that your 192.168.100.X address will change to a public address. I expected that would mean that the 192.168.100.1 address would be unreachable then but I've found that I can still connect to it (not sure how at the moment!). 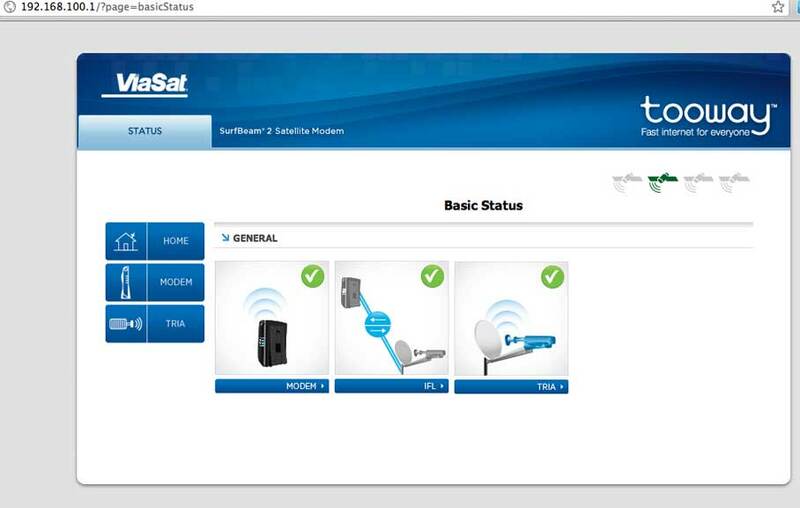 Your post implies that you can't access your satellite modem GUI once the connection is established, is that the case? Many thanks. No idea why I didn't reply to this - sorry. In answer to your question, no, the moment it goes online I can't get access to 192.168.100.1. I'm surprised you can - would you mind posting your ipconfig or network info here? Perhaps the subnet mask is different. 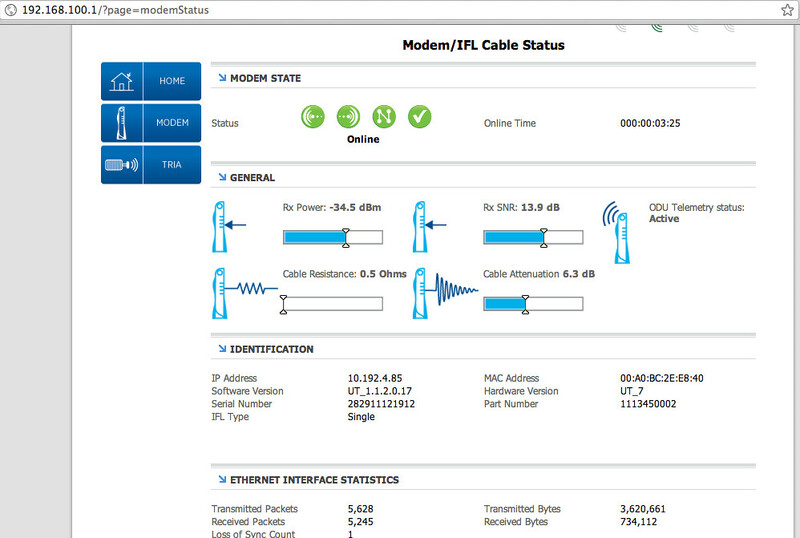 You can get acces to the modem page any time just like any other router by typing its address online or not. hidden menu which is not linked from the main menu. This menu appears only once on setup. After that you need to type in the slash install. This then allows you to change which "colour" beam you are on. This is helpful if you are on the edge of two beams and want to see which one is better. However you may need to re-register your unit with tooway if using a different beam although I am not certain on this. I have finally got my TooWay system activated and is now on line, they sent me a replacement Modem and Tria without any quibbling but it was the Modem giving me the problem, I was also having trouble with explorer on Win10 and was told to use Firefox or Opera but none of these would connect so I tried Linux ( Ubuntu ) although I was told Linux was a no no and it connected with no settings to change at all. I now need a wireless router for wifi which is the main thing I needed the Satellite and noticed you mentioned a Linksys E1200 Wireless Router and how to have it working and was thinking of buying this model. Thanks for all the replies.